Getting an education is something that is becoming increasingly more vital in this day and age. But why is education so important? There exist a variety of reasons, including but not limited to better job opportunities, building confidence and independence, making more money, and being better able to participate in society. These are, of course, not the only reasons education is so important, they are just a few that are going to be touched on. Anyone considering whether or not to get an education (beyond the compulsory K-12 years) should take these reasons into consideration when making their decision. This is probably one of the main reasons people consider getting a higher education. Those with an education beyond high school tend to have a wider range of job opportunities available to them, as an increasing amount of fields require some form of higher education. Anyone wanting to go into the medical field, for example, will need some sort of degree, even if they aren’t wanting to become a medical doctor and are instead looking to become a Registered Nurse or another related job in the field. Wanting to go into childcare? Most states require a certain amount of credits in Early Childhood Education (or a related subject) and/or a certain amount of time as a Teacher’s Assistant before anyone is able to teach or take care of children on their own. This is not just limited to pursuing a degree at a 4-year university. There are a variety of vocational schools that people can attend to learn certain trades, such as plumbing, carpentry, welding, painting, electrician work, etc. These skills are just as vital as anything one can learn at a 4-year university and it is generally easier to get a good job in these fields after attending a vocational school or taking part in some sort of apprenticeship. Want to teach English as a Second Language? Instead of attending 6 or more years of schooling, consider getting a TESOL certificate. These certificates typically take less than a year to complete and include both classroom time and practicums where students are able to practice teaching in front of an actual class of English learners. There is also the option of taking a part in one of the many programs that send native English speakers abroad to act as Teacher’s Aids and Cultural Assistants. On the job training is just as important as anything taught in university and can give anyone wanting to go into any field a leg up. To sum things up, employers are looking for candidates with some form of higher education or on the job experience to show that they have the necessary skills to get the job done. Even if an employer is not asking for a specific degree or certificate, many job listings nowadays have a 4-year degree of any kind as a mandatory requirement for the job. Fields such as office/administrative work, for example, may not always require a degree in Office Administration or a related field, but employers looking for Office Assistants or Administrative Assistants tend to want some sort of degree, and those candidates who are able to meet that requirement are more likely to get the job in the end. You may still be asking yourself, “Why is education so important, other than getting a good job?” Having an education can also boost one’s sense of self-esteem and build confidence. Even if you don’t go to a 4-year university, gaining more knowledge about the world through any means can make things seem less scary or confusing. Fear of the unknown can easily be solved by becoming educated about those things that may be frightening. People who are educated on topics such as personal finances, house purchasing procedures, nutrition, child rearing, etc. are also able to be more independent when it comes to performing those skills. Knowing how to budget and balance a bank account is vital to becoming financially independent. Understanding nutrition can lead to living a better, healthier life and not having to rely on media or other people to help with understanding what to eat. Taking classes or reading books before having your first child can help make the whole process seem less scary: you won’t be going into parenthood blind. Purchasing a home for the first time? Advice is available in abundance online and from family and friends who have already gone through the process. All of these skills and many more can be easily learned by reading up on the topics online, asking for advice from other people who are already skilled in whatever it is you’re hoping to understand, or even taking formal classes. Once someone becomes educated in a topic, they feel more confident in themselves and in pursuing whatever it is they need to get done. Children don’t seem like such a foreign, terrifying idea. Getting a mortgage doesn’t seem like an insurmountable challenge. Making a monthly budget and sticking to it doesn’t seem impossible. Anything can be made easier by just becoming a little more knowledgeable on the topic. Along with the better career paths available with an education comes higher pay. This isn’t just on a personal level; countries with larger amounts of people with a higher education tend to have higher overall GDPs. How do those countries get more people to pursue a higher education? They value education enough to invest more money into sending people to college. European countries, especially Scandinavian countries, that invest in education for all citizens have some of the highest GDPs. Not in one of those countries with a higher GDP? You’ll still benefit financially from pursuing a higher education. Exact earnings will depend on your specific field, of course, but there does seem to be a correlation overall between higher education and higher wages. The median wages of people with Bachelor’s degrees is about 67% higher than those with just a high school degree. This increases even more with Master’s degrees and PhDs. Wanting to become more educated on a topic but don’t have the time or money to pursue classes in a traditional classroom setting? No need to worry, online education platforms are becoming increasingly popular nowadays. 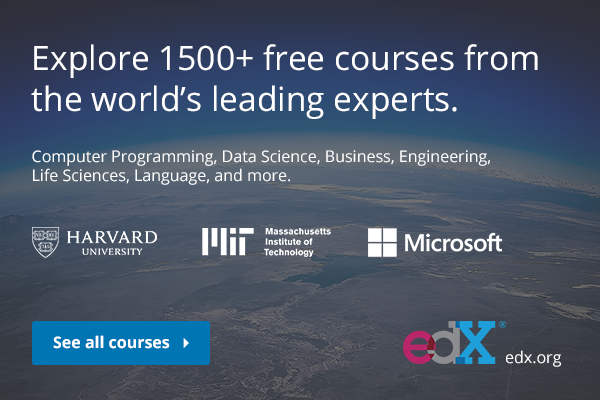 One such website that offers online classes is edx.org. A variety of courses are available to choose from, so anyone can find something to suit their needs. Are you one of the people wanting to learn more about Early Childhood Education, either as a parent or a childcare provider? Go ahead and take a class like The Best Start in Life: Early Childhood Development for Sustainable Development. In this course, you’ll study the importance of education itself in the development of children’s brains and what a successful early childhood education program looks like. Not sure how to manage your personal finances? Take a look at Finance for Everyone: Smart Tools for Decision-Making. It’s an introductory class designed to help everyday people gain more financial knowledge. It uses real-world examples to help anyone learn the basics of finance. A basic understanding of math will help in this course, but you don’t need to be a genius mathematician to learn how to budget and manage your own finances. Are you a seasoned office professional who just needs a bit more knowledge on Microsoft Word, Outlook, or Excel? The Microsoft Office Fundamentals course will help you with that. You’ll learn how to create your own Word documents, make tables and formulas in Excel, and manage your email in Outlook. Learning these fundamental skills can give you a leg up and help you to advance in your career. In conclusion, why is education so important? Because, in the end, gaining more education is all about bettering yourself as a person. Higher education can increase your wages, help you to be more knowledgeable about the world around you, and have better job opportunities open up to you. Even learning skills outside of a specific career field is beneficial, as you can become a more independent person who is in charge of their own life by gaining extra knowledge about childhood education, math, or a foreign language. Whether you’re looking to advance your career, understand the basics of Italian, or to learn some math to help your kids with their homework, education helps create a better, more confident you.